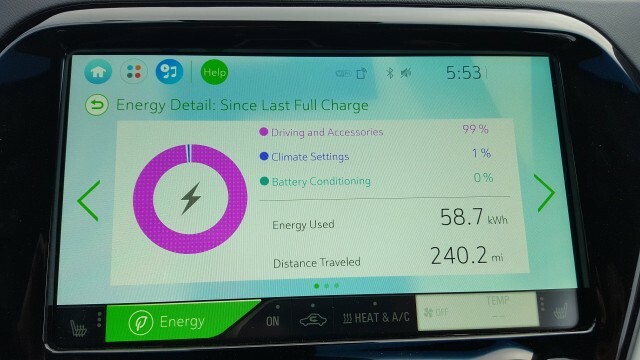 We drove a 2017 Chevrolet Bolt EV electric car 240 miles on a single charge last week. In other words, the Bolt EV delivers on its EPA range rating of 238 miles combined—announced earlier today—in real-world use. Our six-hour drive route took us 235 miles from Monterey, California, south to Santa Barbara, largely along the scenic coastal Route 1. That road was characterized as "one of the most frustrating routes in the world" by a Chevrolet team member, but it was comparatively free of slow-moving rented motorhomes and gawking tourists for at least half the drive. Much of the route was covered at speeds of 40 to 60 mph, but over a stretch of country roads and highway toward the end of the trip, we drove to keep up with traffic—meaning 70 to 75 mph in many cases. At the end, we crested a 2,000-foot pass over the coastal mountains before descending to sea level at our destination—with the air conditioning on low to counter temperatures of more than 90 degrees. A few miles before the final grade, our Bolt had replaced the miles-remaining number in the instrument cluster with an orange “Low Range” warning. Halfway up the grade, that warning began to flash insistently. Not to worry, said our GM passenger; it’ll be fine. We learned later that the warning comes up based a variety of factors. In our case, we found out, it had kicked in on the early side, with some battery capacity remaining, because we’d been traveling at up to 75 mph before starting the steep climb. 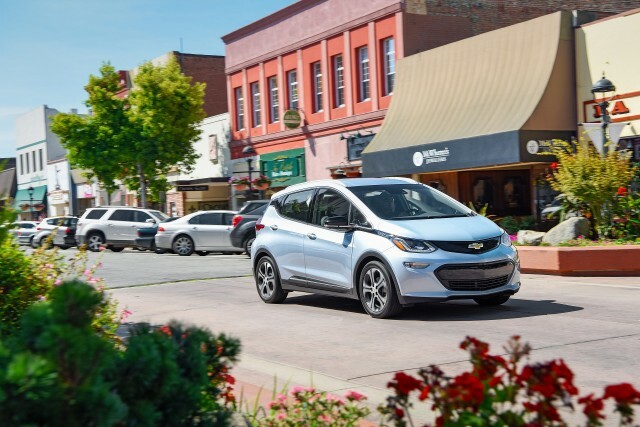 With a 60-kilowatt-hour lithium-ion battery pack and a motor rated at up to 150 kilowatts (200 horsepower), the relatively light Bolt EV felt perfectly capable of handling whatever we asked it to do. Remaining range clearly falls faster when driving at 75 mph than at 60 mph, a function of inescapable physics: the energy used to overcome aerodynamic drag increases exponentially with speed, rather than proportionally. Even at that mix of speeds, our Bolt EV delivered 4.1 miles per kilowatt-hour used. Over our 240 miles, we had used 58.7 kwh, or 97.8 percent of the total stated pack capacity of 60 kwh. Another less aggressive driver achieved 4.8 mi/kwh, and a third came in at 4.5 mi/kwh. Anything over 4 mi/kwh has to be considered a laudable figure for a journey that averaged at least 40 mph and had frequent stretches at much higher speeds. After having driven close to a dozen different electric cars with ranges of 62 to 107 miles, the Bolt EV was the first car in which we could ignore the remaining range altogether for the first five of our six hours behind the wheel. That’s freedom of a sort that only Tesla owners can enjoy today—for prices of $70,000 and up. And delivering that freedom, at a price half that of the average Tesla sold today, sets the 2017 Chevy Bolt EV apart from every other electric car on the market. Over the next three years, it’ll be joined by a second-generation Nissan Leaf, the Tesla Model 3, an electric BMW crossover utility, a compact-sized electric car from Volkswagen, and other vehicles with 200 or more miles of range. But from our long drive, we’d say the Bolt EV sets a high bar against which those vehicles will be measured. NOTE: Certain aspects and calibrations of the pre-production Botl EV that we drove may not quite correspond to the final vehicles that hit dealer floors before the end of the year. Accordingly, some of our impressions may not reflect the cars that will show up at the dealer. 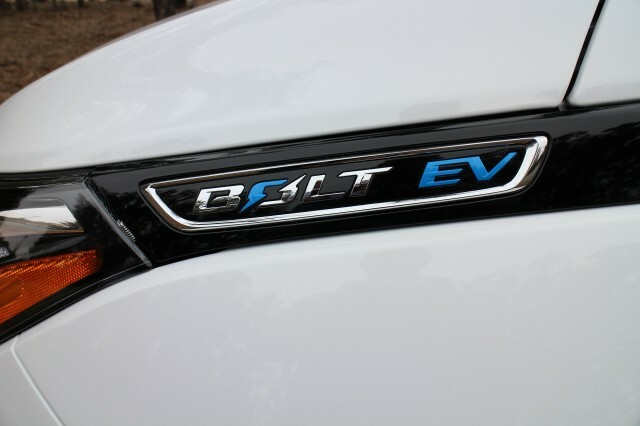 Approached from afar, the Bolt EV’s shape appears short in length, tall in height, and boxy. Still, it’s a bigger car than it appears, substantially larger than something like a Chevy Spark or a Mitsubishi i-MiEV, both classed as minicars. And the interior is wide and remarkably spacious. 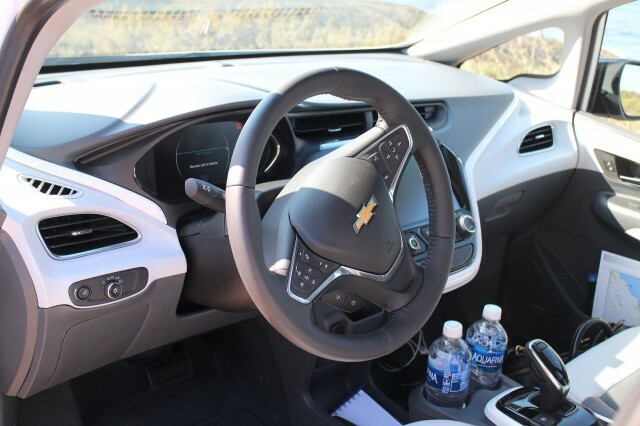 Four tall adults can sit easily inside, and unlike the Volt, the flat floor means the center position in the rear is a real seat, not a “seating position” perched on a hump. WHAT DO YOU THINK? 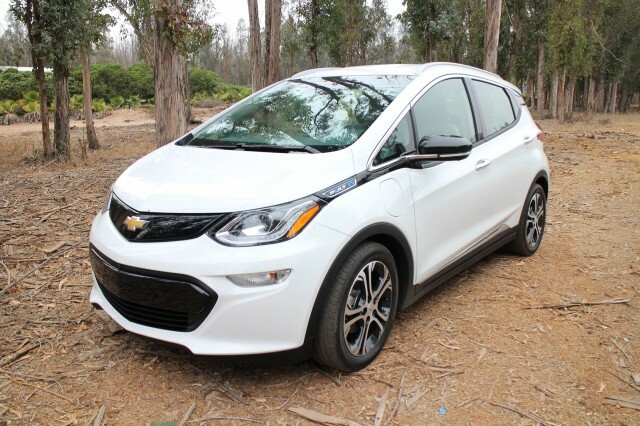 Does the Chevy Bolt EV make the Chevrolet Volt irrelevant? We liked the Bolt’s interior, especially its large and crisp displays, both on the central touchscreen and in the fully digital instrument cluster. Both have a thinner and more elegant font, but the size, resolution, and brightness make them easier to read than some of the darker and smaller screens in other vehicles. And the information presented is simple: speed, range remaining, and energy usage in the cluster, with total energy consumption and other data in the central display. The thin seats are comfortable, and there's room in the back for full-sized adults, though admittedly we spent only enough time there to test them out. When you set out, the normal Drive mode on the “gear selector” lever behaves just like a car fitted with an automatic transmission—complete with idle creep when the car is stopped unless you keep your foot on the brakes. But we spent virtually our entire drive using the alternative Low range, which increases regenerative braking considerably—and will smoothly slow the car to a complete stop without using the brakes. It’s the vaunted “one-pedal driving” launched by the original Tesla Roadster, and now available only in the BMW i3 and (to a lesser extent) the Tesla Model S and Model X. We felt the Bolt EV’s regen was a little smoother around the edges than the i3’s, though we’re eager to test the cars head-to-head to see if our sense was accurate. Chevy deserves credit for offering both types of driving in the same car. Most electric cars mimic the automatic-transmission driving experience, often with various modes that increase regen. Then there’s the BMW i3, which offers only one-pedal driving and no conventional mode. The Bolt EV is the sole mass-market car to offer genuine one-pedal driving and the conventional feel as well, as Tesla does. It’s worth noting, by the way, that the idle creep is entirely absent in Low. And there’s a hill-hold function regardless of mode that prevents the car from rolling back even the driver takes a foot off the brake pedal. On the road, the Bolt EV doesn't feel as heavy as some steel-bodied electric cars do. With a weight of 3,580 pounds, it's relatively light for its 60-kwh battery size and 94-cubic-foot interior volume. Handling and roadholding was predictable, and that 200-hp motor offers more than enough performance to keep up with traffic. Standing-start acceleration is good too. The deceptive thing about the Bolt EV is that it looks considerably smaller than it actually is. 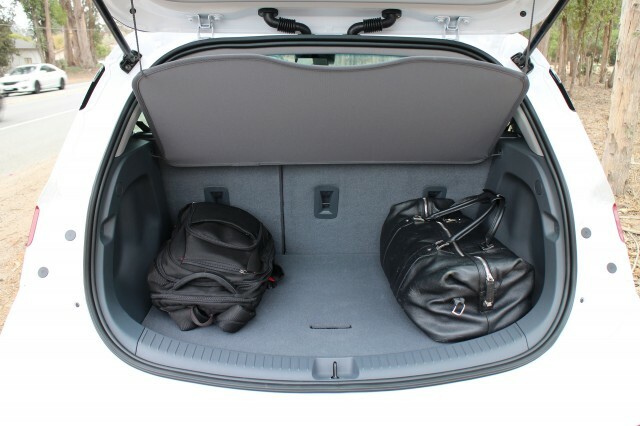 Think of it as a tall wagon or (heaven forfend) a small minivan, and you'll get a sense of its interior volume. In other words, the 2017 Chevrolet Bolt EV delivers more interior volume than you'd expect, superb instrumentation, an electric-range rating beaten only by cars costing twice as much or more, and enjoyable performance. Would we change anything? Well, it could stand to be just a little sexier to attract some buyers. But we can't wait to get a Bolt EV onto our usual test route, since it's the first reasonably priced electric car that can make the run from New York City into the mountains—around 115 miles door to door—without a recharge. Even at speed. Even in the winter. We can't wait. Final details of 2017 Chevrolet Bolt EV pricing, features, trim levels, and options will be released closer to the car’s on-sale date, now expected to be sometime next month or in November. Chevrolet provided airfare, lodging, and meals to enable High Gear Media to bring you this first-person report.